The number of Americans without health insurance continues to sink, with a new Gallup poll reporting the lowest uninsured rate since 2008. At the same time, Republicans in Congress have proposed a bill that could significantly reverse that trend. About 12.9 percent of Americans still do not have health insurance as of the fourth quarter of 2014, according to the Gallup report. That is down from 13.4 percent from the third quarter, and the rate has dropped a notable 4.2 percent compared to the same time last year, when the Affordable Care Act (ACA) first went into effect. 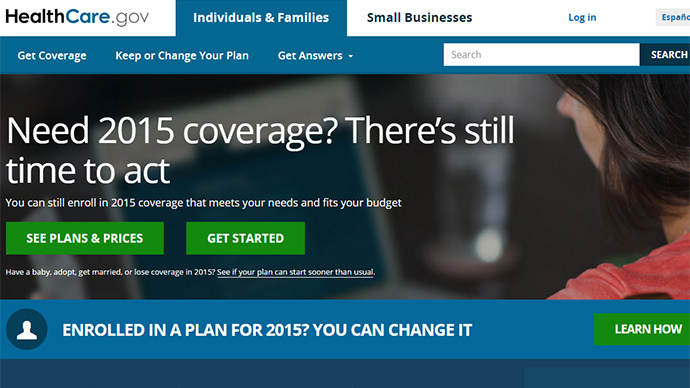 The new numbers come as the latest open enrollment period for the ACA, also known as Obamacare, is underway. That period will officially end on February 15, meaning Americans without health coverage have until then to sign up for it without fear of being fined due to the law’s individual mandate, which requires citizens to obtain insurance. Gallup noted that while more Americans across all demographics are obtaining coverage, the largest changes can be seen among African Americans (where the uninsured rate dropped seven percent), Hispanics (6.3 percent drop), and low-income Americans (6.9 percent drop). According to the Department of Health and Human Services, some 6.5 million Americans had coverage under the ACA’s health exchanges as of late December. Roughly two million of these were new to the marketplace, meaning a large amount of them could have been previously uninsured. Despite this news, critics of the law have put forward a bill that could leave hundreds of thousands of Americans without health insurance and add billions to the deficit. Known as the “Save American Workers Act,” the bill was actually proposed in 2013, but House Republicans are pushing to make it one of the first pieces of legislation they consider during the new year, the Huffington Post reported. If passed into law, the bill would change the way employers are fined for not offering health insurance to their workers. Currently, the ACA requires large companies to offer coverage to any employee who works more than 30 hours a week – or pay a fine. The GOP’s new bill would raise the requirement to 40 hours a week, arguing that it would encourage employers to keep people working over 30 hours rather than cut them in order to avoid the fine. While the details behind this argument are debated, the Congressional Budget Office (CBO) said the bill would lower the number of people receiving employer-based insurance by roughly one million people and increase the number of uninsured Americans by about 500,000. Companies may have more reasons to cut hours, since anyone working less than 40 hours a week would therefore not require insurance from their employer. It also means that more Americans may have to consider other options for coverage, such as Medicaid, the Children's Health Insurance Program, or the marketplaces. The CBO also stated that enacting the bill would add some $73 billion to the budget deficit between 2015-2024. Supporters of the bill remain unconvinced. Rep. Todd Young (R-Fla.), the lead sponsor of the bill, told the Huffington Post that he has enough anecdotal evidence to know his position is correct. New Senate Majority Leader Mitch McConnell (R-Ky.), meanwhile, dismissed the CBO’s analysis. The 30-hour requirement “is wreaking havoc out in society regardless of what the congressional budget view may be of the impact on the U.S. budget," McConnell told the website. "We know the impact on family budgets, and it’s not good. So I think there’s almost no chance we won’t be voting on that at some point." If Congress manages to pass the measure, though, President Barack Obama has stated he will veto it. Another threat to those currently insured through the ACA comes in the form of a lawsuit. The Supreme Court has agreed to hear arguments regarding whether the law, as written, allows the federal government to provide healthcare subsidies to people living in states that do not establish their own online marketplace. Opponents of the law argue it does not explicitly grant the government authority to provide financial support in these cases, while supporters argue the intent of the law clearly does, and that this detail is clarified elsewhere in the law's text. If the Supreme Court agrees with ACA opponents, it could mean that health coverage for many Americans becomes too expensive for them to afford.